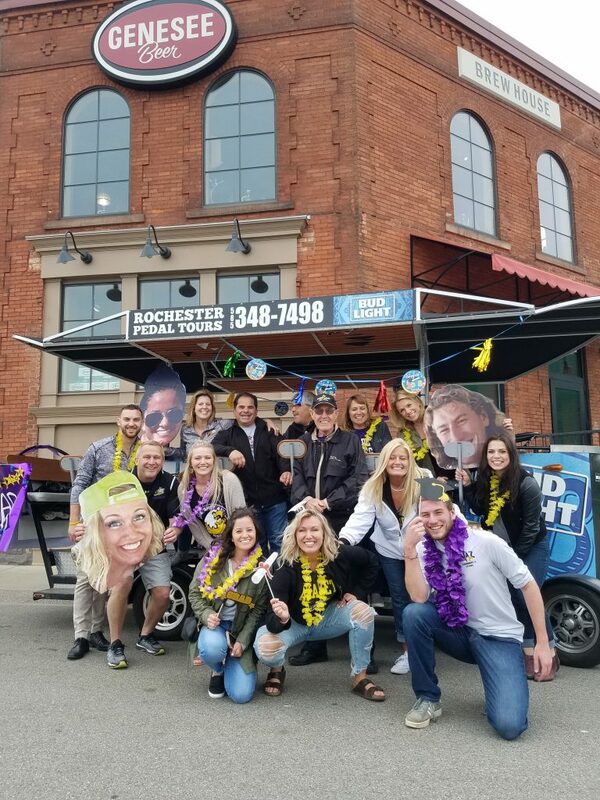 On your tour, you can play your own music off your phone via our Bluetooth speakers, bring your own food, snacks, appetizers and candy, decorate the pub crawler to celebrate a birthday/bachelorette party; all with us being your tour guide/DD. This will be the coolest team building activity that your company has done! Email us with any questions at rochesterpedaltours@gmail.com. We pride ourselves on responding to you quickly with detailed responses. 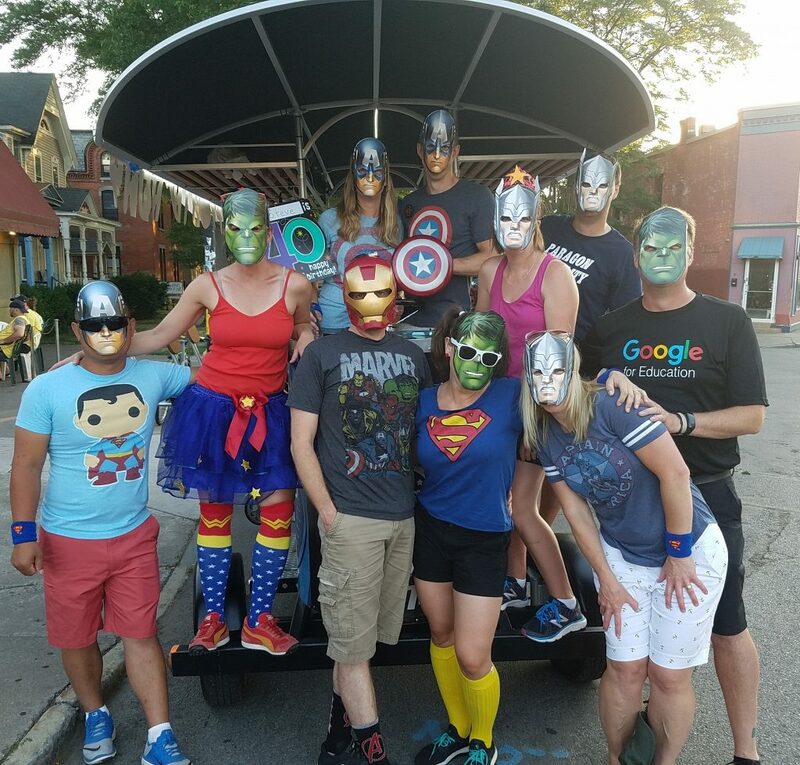 We also have a partnership with the East Ave Inn (behind City Grill) for a discounted overnight stay and they will pick up and drop you off from Marshall Street Bar and Grill which is where your pedal tour will begin and end. To take advantage of this discounted rate simply call the front desk and let them know you are doing a pedal tour and want to take advantage of this special rate. Our goal is to make sure that organizers job is as stress free as possible which is why we use our experience to help you out every step of the way. When you click the green book now button on our homepage you are able to view an up to the minute availability calendar which is where you will book when the time comes. Simply type in your name, email, phone number and credit card information and the date and time is yours. The best part is that right when you book you get an awesome confirmation email automatically sent to the email you provide us. It tells you where to be, at what time, bring this, dont wear that and everything we feel is important for groups to know ahead of time. You just forward or copy and paste the email to everyone coming so you do not have to say everything over and over and this way no one can say you did not tell me this or that. They just did not read what you sent them. Your driver will call you in the week leading up to your tour to walk you through the day of your tour, to find out what bars you want to visit and to answer any questions you have. Our drivers do much more then just drive you around, the big thing they do on the day of your tour is take all the group photos on your phone. Make sure you have plenty of battery and memory so they can snap away and capture the memories for you.